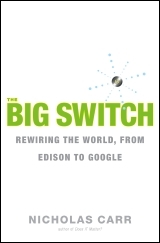 Several months ago, I received an advanced copy of Nicholas Carr’s newest book, The Big Switch: Rewiring the World, from Edison to Google . I immediately read through most of it while on a business trip and yesterday finally managed a few minutes to finish the last few pages. So, here’s my slightly-late review of this very good book. I was pretty familiar with Nick’s works before I started reading The Big Switch, from his infamous article/book, “Does IT Matter?“, to the daily writings on his blog. With that in mind, I was ready for a full-blown business/technology book when I sat down to start reading. Within a couple of chapters though, I realized Nick was thinking a lot bigger than enterprise information technology with this project. At its core, The Big Switch is about the trend of what is sometimes called utility computer or cloud computing – running applications and storing data on remote servers on the Internet. Carr covers the technologies and the major players – Google, Microsoft, Salesforce.com, and others – but he doesn’t dwell on pure technology for very long. He spends a considerable amount of time talking about the potential downsides of living with his so-called “World Wide Computer”, from job displacement to its impact on personal privacy. I was often challenged to consider new arguments about companies and technologies I felt I already knew very well. This book also contains a bonus in the form of a history lesson, alluded to in its subtitle. Carr goes back 125 years to the Thomas Edison’s development of the light bulb and electric power distribution. He weaves the fascinating story about electricity’s transformational power over our nation with technology in the present day. He draws some surprising parallels between the development and evolution of computing and the power distribution industry of over 100 years ago. Nick makes a good case for this comparison in early chapters, which he then uses as the basis for many of his arguments later in the book. I highly recommend this book to anyone with an interest in computing and technology. It’s well written, easy to read, and very informative and entertaining. And who knows – it might even make you think.